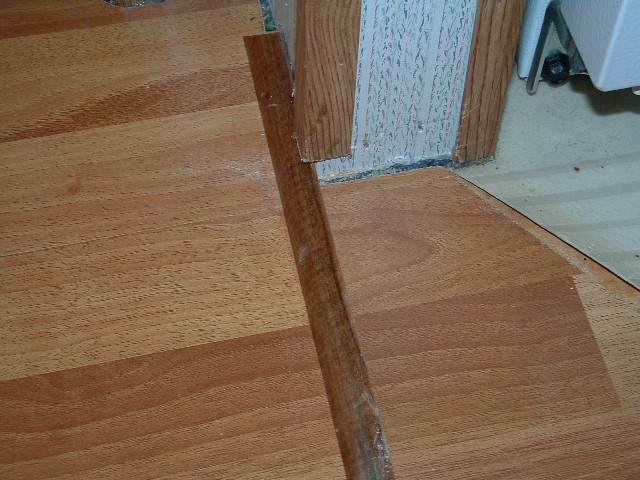 The main problem I have when installing quarter round in mobile homes is getting the exact cut at corners that have the corner trim. 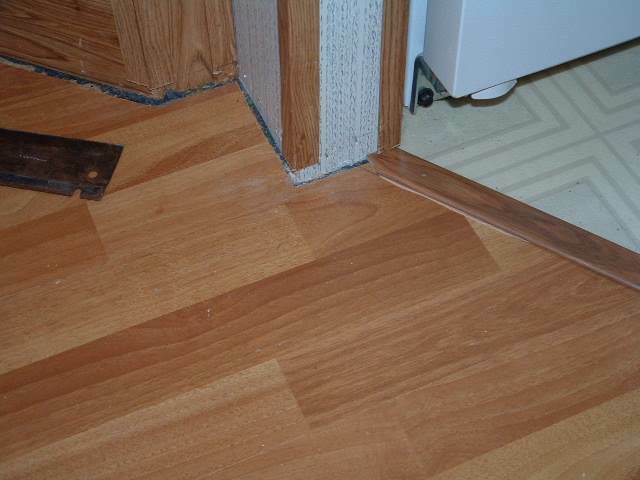 In the majority of mobile homes that I work in, there are trim pieces that are on the outside corners. The paneling or wall board used to cover the walls in mobile homes, meet at the corners and are covered with a simple trim that is usually nailed on the corner. This can make it difficult to get a precise measurement for quarter round or base board. These trims are installed down to the floor. They need to be cut so the quarter round or base board can be installed under them. In this photo I have already cut the bottom of the corner trim off so I can install the quarter round under it. I usually do this after the laminate flooring is installed. You get a more accurate cut this way opposed to doing it before the laminate is installed. In this photo I use a hand jamb saw and a piece of the quarter round that is going to be installed on this wall as a guide. I hold the quarter round flat on the floor, and cut the trim with the jamb saw. 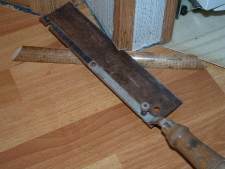 You could also do this with a regular saw if you wanted to. The jamb saw makes it easier because I can swivel it to cut from the other side if I need to. This jamb saw I'm using in this photo, I purchased at Lowes for under 20.00. This is how the quarter round will fit against the wall and under the corner trim after it is cut.